Campaigners have uncovered the minutes of a pride planning meeting that was held in November 2002. Read the full minutes here (PDF). The meeting was told that two methods could be used to close the roads but that a charge could not be made to enter either way. Despite this, the following August, the public were locked out from the streets of Manchester's gay village if they didn't purchase a wristband for Europride. That continued every year until 2014 when the campaign group Facts About Manchester Pride blew the whistle on the unlawful practice. The following April the Local Government Ombudsman ruled (PDF) and the game was up. We have yet to find or hear any explanation about why they went ahead. 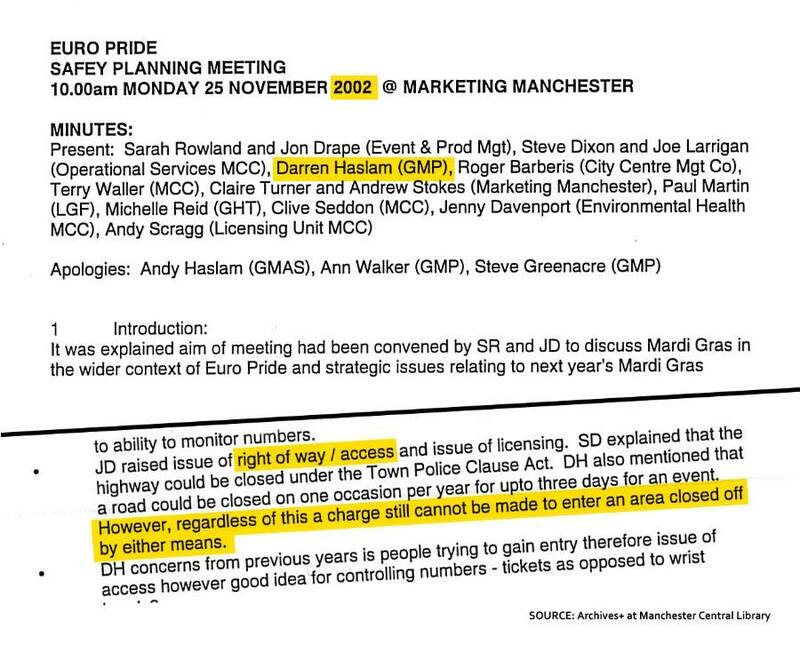 Present at the meeting in 2002 were representatives of Marketing Manchester, Manchester City Council, George House Trust, The Lesbian and Gay Foundation (now known as the LGBT Foundation), Greater Manchester Police and the organising team of Europride (which was renamed Manchester Pride in 2004). Why was the advice, which appears to have come from the representative of Greater Manchester Police (GMP), ignored? Why didn't GMP stand up for the rights of the public and defend the law? The misery these organisations and businesses inflicted on residents and some members of the LGBT community is hard to measure. For 12 years those who couldn't afford to buy a ticket or couldn't justify the cost were unlawfully locked out from the streets of the gay part of Manchester during a so-called "pride" event. It's laughable for this same crowd and others who have ignored this since 2015 to bang on about Tories and Section 28 when this cruelty and mental anguish (and that is no exaggeration) was inflicted upon us by members of our own community and a (neoliberal) Labour council for years. From 2011, the campaign group Facts About Manchester Pride raised concerns about what was going on and faced an onslaught of abuse. And still it isn't over, as the current organisers of Manchester Pride stay silent about this. As do the cronies: GHT, LGBT Foundation, the Manchester Evening News and others. In their untruthful back-to-front PR and fake news they talk about "inclusion" and the gay village being a "safe haven" when the complete opposite has been true for years. Recently Bloom Street was named as the joint 15th most crime-ridden street in England and Wales and an incredible 61 violent and sexual crimes were reported for the village area during June 2018. Are these individuals really friends of ordinary LGBT people? Whose interests do they represent?